Reading is situated in the county of Berkshire, some forty miles to the west of London. The town has always had interesting buses operating on its streets. In days gone by the bus services were operated by the Corporation in and around the town with Thames Valley taking care of the country area routes. The Corporation ran trams and later trolleybuses and were always at the forefront operating new and innovative types of buses. This DVD programme looks at the buses running in the town starting with archive video taken by Malcolm King in 1991. Here we see a whole host of interesting vehicles, starting with a former Harrow Bus Metrobus Mark II still in it’s former livery operating alongside Reading Transport’s own Metrobuses and Metropolitans. Some of the Metropolitans were acquired from London Transport and Tyne & Wear PTE. Reading Transport’s Leyland Olympians and Titans are seen in the traditional Reading livery of maroon and white together with former Alder Valley Bristol VRTs in ‘The Bee Line’ livery. Our next archive video is from the camera of Joe Ward. Filmed in 1992 and 1995, we see how the fleet has transformed its livery to maroon featuring more cream with a green stripe. The 1992 footage shows former Bee Line Leyland Nationals now with Newbury Buses fleet names as well as some of the former Bee Line Bristol VRTs wearing Reading Buses fleet names following their takeover by Reading Transport. We also see Hestair Duple 425 coaches and coach seated Leyland Olympians in blue London Line livery. The Reading Buses fleet is mainly Metrobuses and Titans in the mostly cream livery. 1995 footage shows Reading Buses liveried Optare Deltas and Spectras with the usual Metrobuses and Titans running alongside. The most noticeable addition to the transport scene are the former London Transport AEC Routemasters in the fleet of Reading Mainline, running in competition with Reading Buses. Joe also makes a visit to their depot in Cardiff Road. Local independents such as Tappins, Tillingbourne and Chiltern Queens are also seen in this section. We now jump forward twenty years to 2015 when our own independent transport videos cameras visited Reading to catch up on the transport scene! So much has changed. Reading Buses have introduced a new generic livery of silver and metallic grey, which looks very smart. 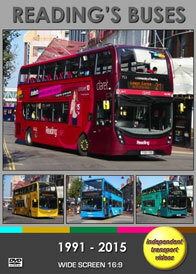 All routes are now colour coded, with the buses painted in the colours to match the route they operate on. The fleet is very modern, featuring many advanced vehicles. The newest double deckers are ADL Enviro 400MMCs’, built to the latest design that operate on the ‘Emerald’ and ‘Claret’ services. Some are also in the generic livery. Latest single deckers are Scania Enviro E300SG models that operate on a variety of routes. Also seen are new Wright Streetlite single deckers, along with older double deckers in the form of East Lancs bodied Scanias, but you will have to watch the DVD to get the full picture! Buses from Stagecoach and Arriva make an appearance as well as Thames Travel and independents, Courtney and Stewarts. First is now only represented by the ‘Railair’ service, as the Berkshire operations have recently passed to Reading Buses. The main trunk route to Bracknell and Wokingham is now branded as the ‘Lion’ route using a smart yellow and light brown liveried ADL400 double deckers. Filming takes place in the town centre and outside the main Reading Buses depot in Great Knollys Street. Our cameras made a further visit in December 2015, which also included a brief visit to Newbury to see Newbury & District in action. We hope you enjoy your visit to the very colourful Reading!